Sukh Mahal Was Made Famous By Rudyard Kipling Who Was Inspired To Write 'Kim' During His Stay Here. Sukh Mahal is a summer palace. A splendid building surrounded with a thriving garden, it is believed to have an underground tunnel connecting it with the old palace. Built on the banks of the Sukh Sagar lake, the white building of Sukh Mahal appears as though its foundation is inside the water. 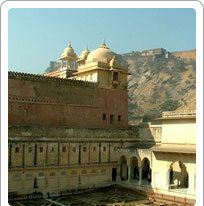 Sukh Mahal or the Palace of Bliss was the venue for debauchery by the Princes. The nearby forests were used for boar hunting.